In each of the last two academic years, a Marco graduate student has won a Fulbright Fellowship, recognized around the world as a gold standard of achievement in scholarship and research. Created in 1946 through legislation passed by the U.S. Congress and signed by President Truman, the Fulbright Scholar Program has sponsored international exchanges intended to advance learning and bridge cultural boundaries. It has been wildly successful. Fulbright alumni include renowned scholars, scientists, artists, and government leaders. Marco is proud to recognize two of its own, Jeremy Pearson and Lydia Walker, among their number. 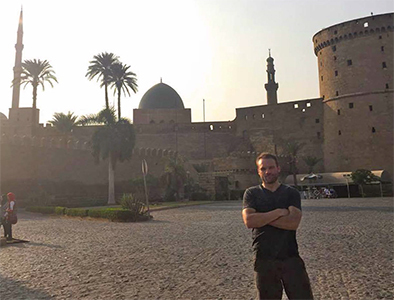 Jeremy Pearson (history) spent most of the 2015-16 academic year in the Middle East, dividing his time between Jerusalem (where he was based as a Fulbrighter) and Cairo, with stops in Lebanon, Palestine, and Morocco. His research focuses on how members of different religious groups, particularly Christians and Muslims, talked to each other in the later Middle Ages. His time in the Middle East enabled him to live the topic of his research. Pearson at the Citadel of Sultan Saladin al-Ayyuby and Mosque of Mohammed Ali in Cairo, Egypt. 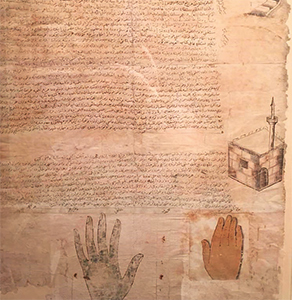 The Adhname of Muhammad, a writ of protection supposedly dictated by the Prophet granting permanent rights and protections to the monks of St. Catherine’s Monastery, Egypt. Lydia Walker (history) currently holds a Fulbright in Belgium and works in the Royal Library in Brussels and with the academic community at the University of Ghent. 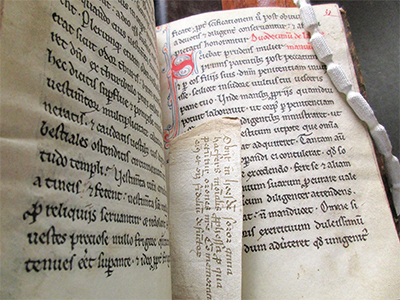 Her work focuses on medieval preaching, requiring her to pore over 800-year-old handwritten collections of sermons. 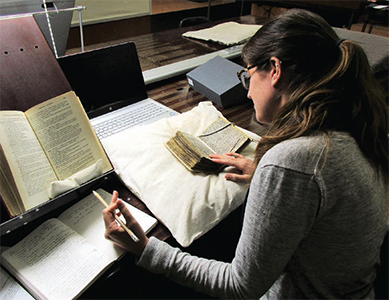 Examining manuscripts, however, is only part of the picture. A 12th-century manuscript of the Vita of Marie D’Oignies, highlighting the death notice for Sister Anna on the small insert slip. Walker looking at MS 12131-50, a 13th-century collection of sermons from Liege, at the Bibliothèque Royale de Belgique in Brussels.